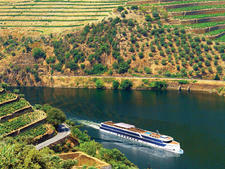 With comfortable well-designed ships and thoughtful inclusions, Vantage Deluxe World Travel -- a Boston-based tour company that celebrated its 35th anniversary in 2018 -- keeps building upon its robust land programs with river cruises that are easier on the wallet than many, without sacrificing quality. Group travel focus might grate on those used to more independent explorations. 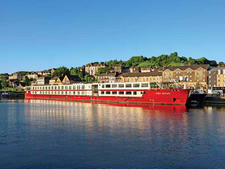 Vantage provides a good value in European river cruising, with dependable tours and modern ships. River Splendor, which launched in March 2013, is one of the line's custom ships. 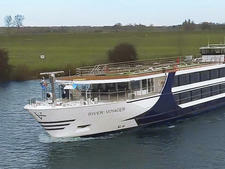 (The others are River Voyager, which launched in 2016; River Venture, another spring 2013 addition, and River Discovery II, which went into service in 2012.) The line caters primarily to passengers older than 55, and incorporates extensive market research into its ship design, particularly when it comes to technology usage and cabin preferences. Case in point: Eight cabins on River Splendor cater to solo travelers, a key amenity, and one that distinguishes Vantage from competitors. Suite options have also been expanded, and all cabins have hotel-style beds (most of which can be arranged as either a double or two twins). On the technology front, the line expanded its broadband capabilities to make Wi-Fi available throughout the ship, and a computer room has both Macs and PC's available, as well as a printer. iPad minis are also available to passengers during each trip. The in-cabin flat-screen TV's offer a browsing menu so passengers can check out Vantage's other trips -- and cleverly record which ones are viewed for follow-up and booking. River Splendor and its sister ships mimic some of the more notable features of the Viking Longships, including the Captains Club, a public area in the aft of the ship that offers more casual dining options and a retractable roof that lets in natural light. Vantage has also given its main lounge, Latitude 52 degrees, outward-facing doors that can open during nice weather. While other lines experiment with full-size verandahs, the Vantage fleet has gone with French balconies instead of full; the ships are similar to other new-builds in the level of luxury and amenities provided in the cabins and bathrooms. Vantage also has four program directors for each cruise, which gives the trip more of a "tour feel." That said, these local guides can give passengers valuable insight into the culture that you might not find elsewhere. All in all, River Splendor and the other new ships in the Vantage fleet represent a conscious effort to stay current with its customers' expectations of "value luxury," a business decision that will stand the company in good stead going forward. The average age of a River Splendor passenger is 70, plus or minus a decade. It's a well-traveled bunch, albeit one that enjoys the convenience of group tours. Although it avoids travel agents, Vantage does promote bookings for affinity organizations and large families, and it has a well-developed Group Leader program. Pre- and post-trips, as well as the open seating and daily city tours, encourage mingling. As with most river cruises, the ship doesn't offer formal nights, and onboard dress is casual. Shorts and jeans are not permitted at dinner. For the Captain's Welcome and Farewell dinners, men may want to pack a sports coat, and women might throw in a dress or nicer top and pants. You'll want comfortable walking shoes for touring, as many towns have cobblestone streets. Women won't need heels. The ship's onboard currency is the euro, and money can be exchanged at the reception desk. (There is a small fee for converting U.S. dollars.) Travelers checks are not accepted; credit cards taken include Visa, MasterCard and American Express. Gratuities for the crew are paid at the end of the trip, in cash or with your credit card as an addition to your total bill. The company pools tips, and you are not encouraged to give individual amounts to waiters or housekeeping staffers. The recommended amount is 9 to 11 euros per person, per day. Program directors are considered individual contractors, and they can't accept credit cards or travelers checks. The company recommends 4 to 6 euros per day for them. Gratuities for local guides and bus drivers are included. Tips are not automatically added to bar bills. Vantage's jazz-themed River Voyager boasts lounges and restaurants named after New Orleans icons like the Cotton Club and Bourbon Street, and artwork that pays homage to legends like Louis Armstrong, Ella Fitzgerald and Dizzy Gillespie. With 134 passengers River Venture carries as many as 65 fewer people than many other river ships, almost all hailing from the U.S. 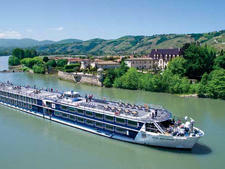 Carries 176 passengers, is aimed at mature North American travelers with high expectations, has a 4-to-1 passenger-to-staff ratio and 78 percent of cabins have a French balcony. A nimble vessel sailing the Mediterranean, a trip on La Perla is as close as you can get to having your very own yacht.